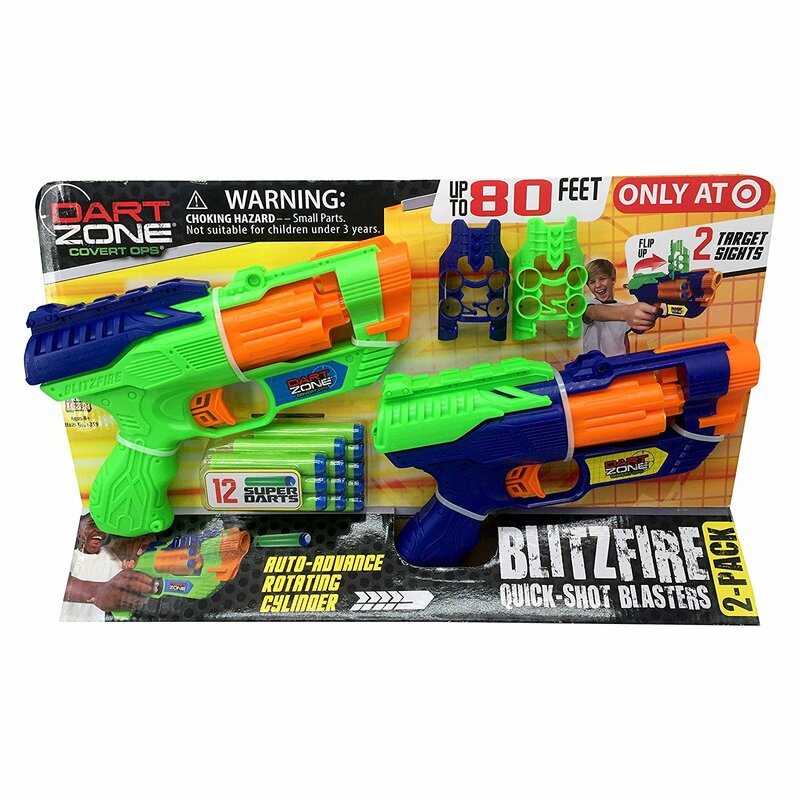 The BlitzFire is a double-pack of action including two blasters that each feature built-in sights for more accurate targeting as well as auto-advance rotating cylinders to ensure rapid blasting. The advance rotating cylinders not only help with rapid blasting, but also ensure quick reloading. This blaster ensures maximum efficiency in the heat of the battle with their 6-dart auto-advance rotating cylinders and darts that fly up to 80 feet! Darts Fly up to 80 Feet! These are super fun and easy to use! Best part of all is that is comes in a two pack, so when friends are over you always have an extra blaster on hand for play! All you have to do is pull back on the slide, return it, pull the trigger, and fire. These are super fun blasters. Kids will love seeing how far they can shot...will they make it the 80 feet? A huge plus is that these blasters do not take batteries! Kids will use their imagination and come up with all sorts or fun scenarios while playing with these blasters! Darts work with Dart Zone Blasters and Most Standard Blasters from Leading Brands. Blitzfire Quick Shot Blasters is available at Target for just $14.99!!! Make sure to pick these up for someone special this Christmas!